Looking for Christmas tree decorating inspiration? 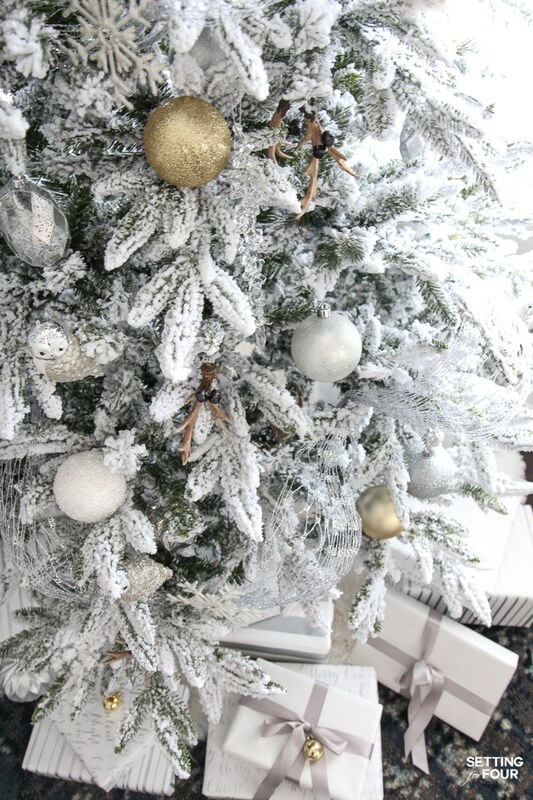 See my ELEGANT FLOCKED CHRISTMAS TREE – WHITE AND GOLD GLAM STYLE! I show you how I use mesh ribbon, beautiful white and gold christmas balls, icicle ornaments and sparkly owls to decorate a traditional christmas tree with a glam transitional style. I’m so excited to be sharing with you my Christmas Tree today! Do you love looking at Christmas trees as much as me? Of all the holiday decor, the tree is the most beautiful I think! 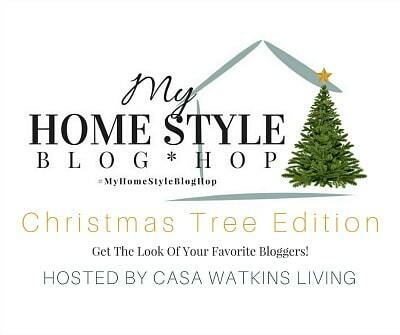 Today is also special because this post is part of a 25 creative design blogger tour hosted by sweet Stephanie at Casa Watkins Living called ‘My Home Style: Christmas Tree Edition’. The aim of this ‘My Home Style: Christmas Tree Edition’ blog tour is to introduce readers to a variety of decorating styles and to inspire you as you decorate your tree this year! I love getting inspiration from decorators myself, it’s always fun to get new ideas to try! If you’re coming from Deeply Southern Home – welcome! I’m so glad you’re visiting! If you’re new here, here’s a bit about me: I’m an Interior Decorator, Design and Lifestyle Influencer and proud military wife! You can check out my All About Me to read about why I started blogging after overcome adversity in my life…..and if you enjoy my blog please subscribe! 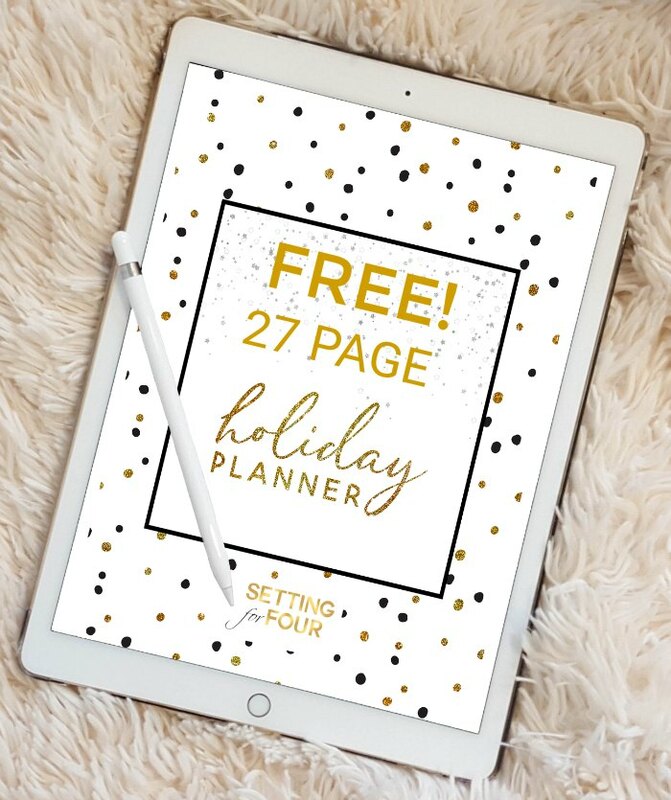 I’m offering a FREE 27 page Chic Holiday Planner to new subscribers – it’s really handy to keep organized this time of year! In this tour each blogger will describe their interior decor style in 3 words. My design style is Timeless, Transitional Glam. 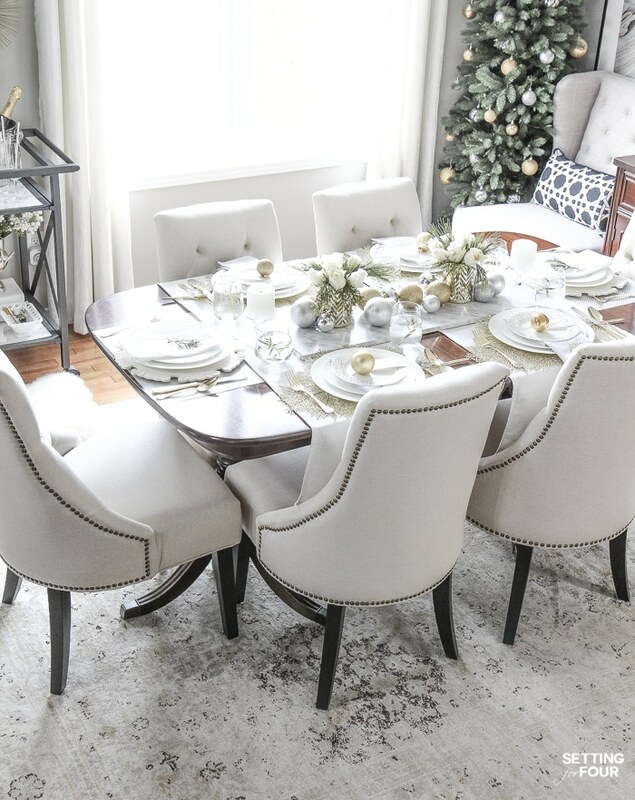 Timeless: I love timeless style, especially timeless furniture looks because like the name says, it stands the test of time and always looks current and fresh! My flocked tree is timeless ( This tree is the GE Alaskan Fir flocked Christmas tree that I bought at Lowes.) 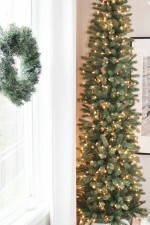 The flocked tree style has been around for a long time and I believe will be in style forever! 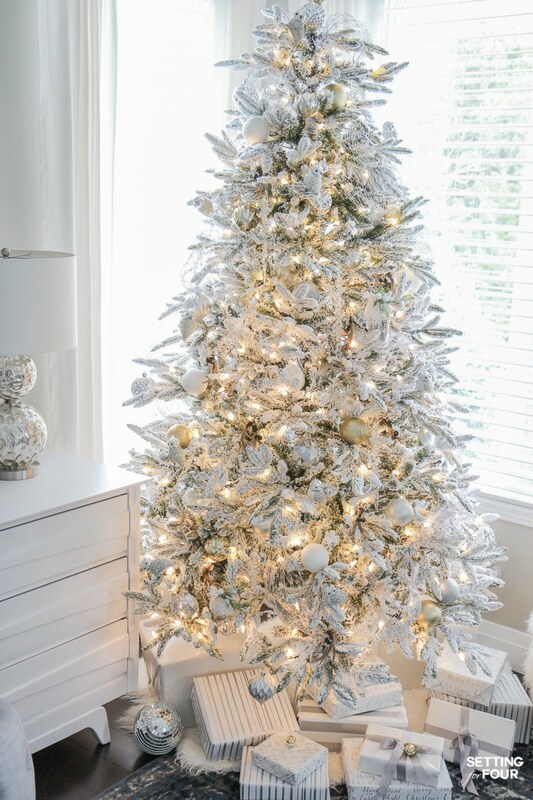 I also have a more trendy all white tree, it’s gorgeous too. I also love timeless neutral colors: white, black, cream and gray. 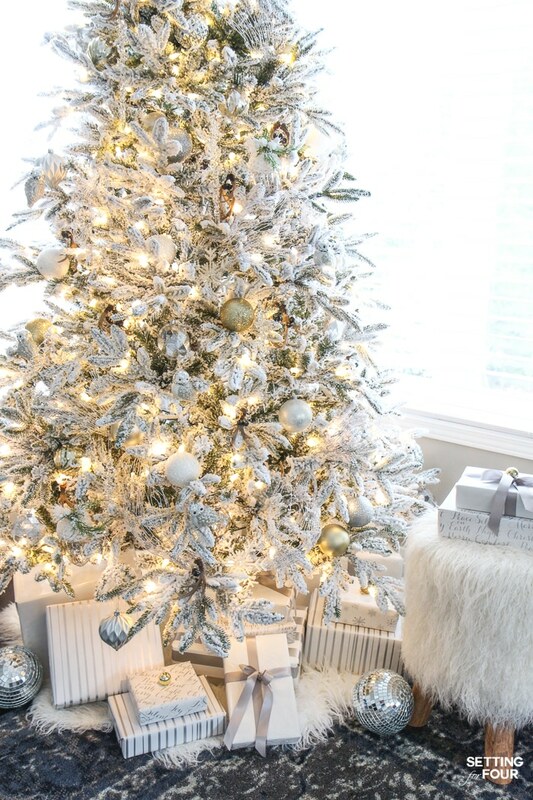 I usually use an accent color like indigo blue with my neutral colors but my tree this year is all about layering neutrals with metallics for a timeless monochromatic look. I also used timeless gray satin ribbon on my Christmas presents this year! See all of my paint colors here including my go-to favorite gray color! Transitional: My transitional decorating style is a mix of traditional and contemporary. I love taking traditional looks and tweaking them with clean lines, contrast and metallics. My ornaments are traditional shapes but have contemporary metallic finishes and colors. I also used a traditional ribbon in my tree this year, but it’s instead of satin or velvet I used modern silver metallic mesh! 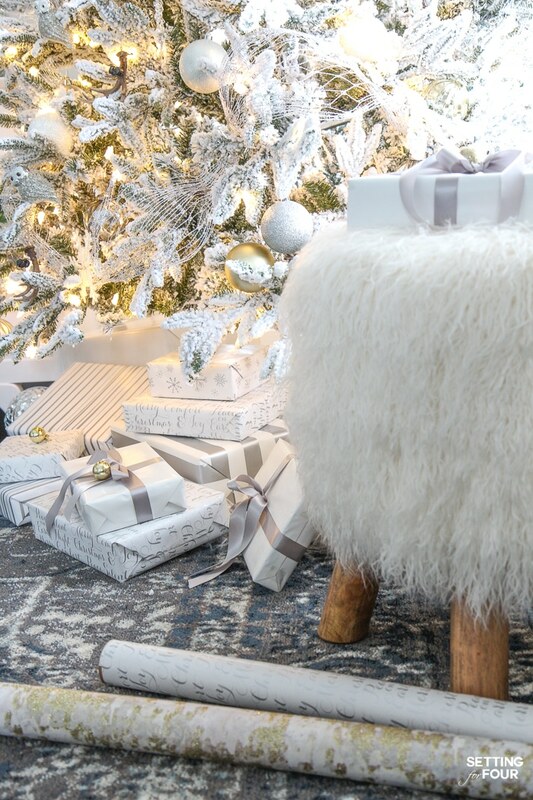 Glam: I am obsessed with glam fabrics like Mongolian and faux fur ( I used a faux fur tree skirt this year – it’s so gorgeous!) – do you like my fun Mongolian fur stool? I’m also obsessed with glam finishes, shimmer, shine, sparkle and metallics in gold, silver and pewter. A lot of my ornaments have sparkly metallic finishes – like these beautiful glam owl ornaments…which really glow against the twinkle lights of the tree. 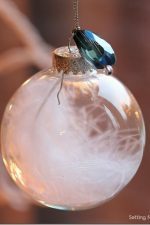 And I can’t forget to mention these stunning glam glass icicle ornaments! They look like real crystal but weren’t expensive at all! Sources: Click the links below to see more about each item! 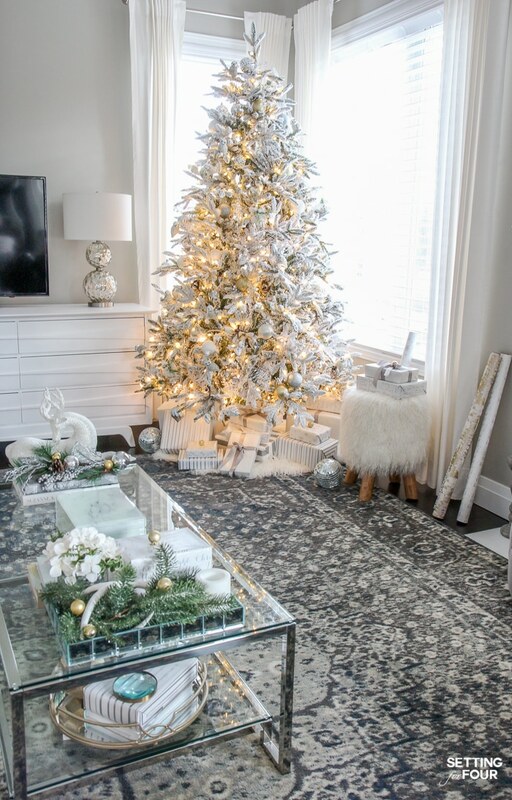 I hope you liked my Flocked Christmas Tree – White and Gold Glam Style and tree decorating ideas! The next stop in the My Home Style Christmas Tree blog tour is Little Red Brick House! 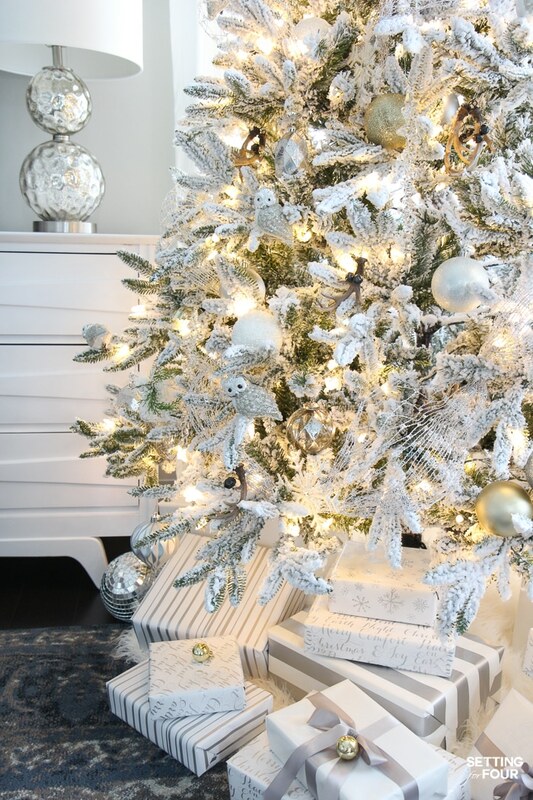 Head on over to see her inspirational Christmas Tree and Home Style! Wow! Just WOW, do I need to say more 😉 It’s so elegant and beautiful and so you. Merry Christmas my friend. Beautiful tree! So light and bright. Thank you Jessica – I’m so glad you like our flocked tree!! I so agree with Julia, this is just wow. Gorgeous. Prettiest tree I’ve seen this year, Heather! Amazing!!! Merry Christmas!! Oh my gosh – I thought I answered you! Thank you so so much Julie and I hope you had a beautiful Christmas! Happy New YEar! Wowzers! What an extraordinary tree! I love the blend of ornaments with the flocked tree. Makes the tree look like a festive, monochromatic dream. Oh! I love that fur stool!! Your tree is just stunning as is the rest of your room. Beautiful Christmas decor! Gorgeous! I love the flocked tree! Thank you so much – I’m glad you like it too! That tree is beautiful, I bet it would be stunning even with no decorations because the flocking is so full, yet still feels like delicate snow! The gold ornaments are really stunning with it. 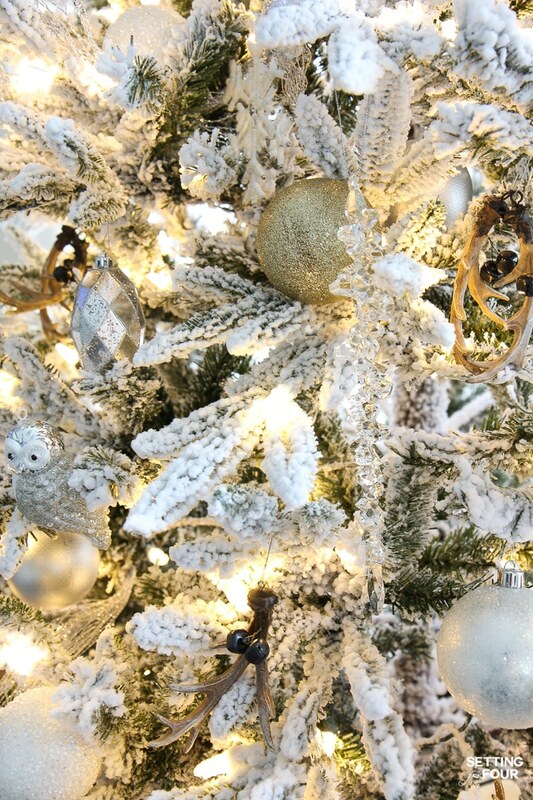 Your tree is simply stunning… magazine worthy! I think tree is all you described and more. Just stunning!! I’m swooning, Heather! All the white textures are so gorgeous together! I adore the little woodland animals tucked in among all the snow — absolutely perfect! You have me pining for a white Christmas in my home next year! 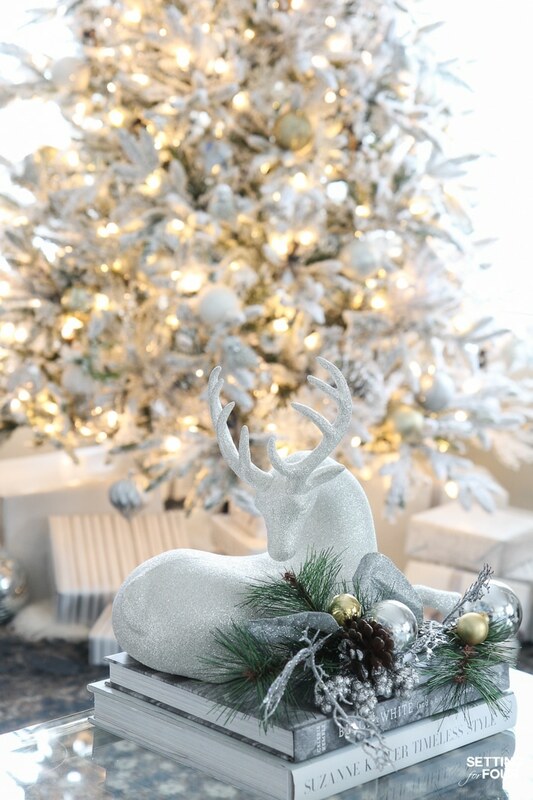 Thank you so much Brynne – I’m so happy you like our flocked tree!! Hey Little sister that is one beautiful tree. My tree right now is leaning and I have to fix it to stand up straight. I’m wondering if it is time for an artificial tree. Take care. 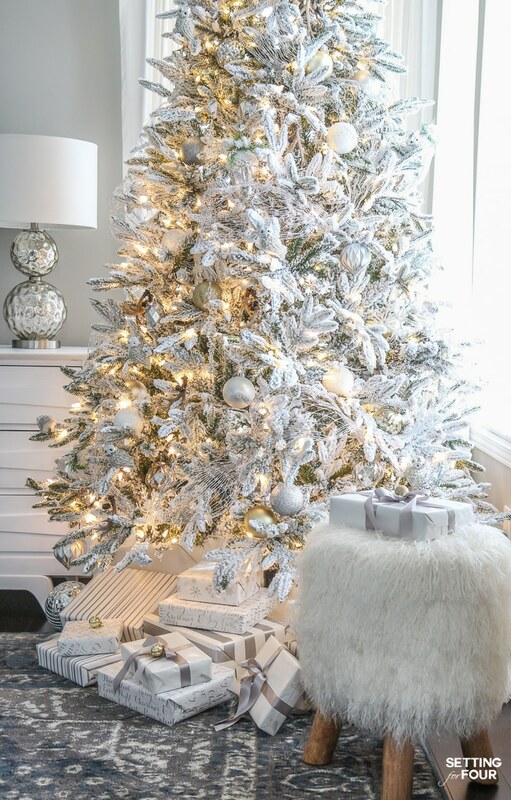 I always love a good flocked tree–and your simple glam color scheme is perfect with it! Beautiful! I’m so glad you like it Jess!! Flocked trees are my fave!